First of all, please forgive me for the terrible pun. Try as I might, I could not resist the title of this piece. Anyway, as you may or may not have understood by now, this article is about Marcus North, Ian Bell and the contrasting points in their careers. The number 6 position in the batting line-up is perhaps the trickiest of all. If you are part of a strong batting order, more often than not, you walk into a situation, where your captain wants you to score quick runs before a declaration. If you are part of a weaker team, your job is usually, to shepherd the tail and muster as many runs as you can, before your team is bowled out. Sometimes, it can be a thankless task. You are just expected to turn up and perform, regardless of the situation. If you score runs, you are considered to be just doing your job; if you fail, you are easy pickings. Just ask VVS Laxman. Despite an impressive record over the years, whenever there is talk of dropping batsmen, his name is one of the first to be bandied about. Despite this, some of the best players have this made this position their own. Laxman (51.88 avg), S Waugh (51.04), Sobers (53.34), Border (52.16), Chanderpaul (65.73) and S Malik (56.82) are some of the players who have thrived in this slot. When the team is four down, and these players stride to the crease, the opposition know that they will have to work extra hard to get to the lower order. Invariably, the performance of the number 6 batsman is a good indicator of the relative performance of the team. That brings us to North. No other player in recent memory has done so little to keep his place for so long. With an average of 35.18 after 35 innings with 5 centuries and 4 fifties, it is hard to believe that he occupies the position once successfully held by the likes of Allan Border and Steve Waugh. It is perhaps, a sad reflection of the batting talent in Australia, that North is the best alternative there is. He is one of those infuriating players, who when on the verge of getting dropped, scores a century, and keeps his place for the next few games. Case in point, Bangalore 2010. Unlike other players, who usually catch a second wind, and begin to score consistently, North proves an exception to the rule. While most successful no. 6 batsmen possess a handy record in the team’s 2nd innings, North’s average is a paltry 18.33 with 2 fifties; and it shows. In the second innings at Adelaide, his team needed him more than ever. He came in and scored a brisk 22 before falling to Swann. Story of his career, really. The Australian batting is so brittle now, that it needs a consistent batsman to prop up the line-up from lower down. Instead, they are left with a batsman who himself does not know where his next big score will come from. It is not that he doesn’t know how to bat. He is fluent most of the time; but inexplicably, he gets outs before kicking in, to post a bigger score. Perhaps, if the top order was doing its job, he could get some leeway; but he doesn’t have that luxury. The only thing going for him is his occasional off-spin. He has a knack of getting wickets now and then; and for a team, still searching for a premier spinner, he comes in handy. Still, Australia would trade his wickets for some consistent runs from their number 6 batsman. Then, there is Bell. While he has the luxury of in-form batsmen playing before him, he still grabs whatever chances he gets, and makes them count. There are good examples in this Ashes alone. In the first test at the Gabba, he came in, with England in some kind of strife, and proceeded to play with confident strokes and a free mind. Here was a player, who is well remembered for his past frailties, especially in 2005, where his fidgetiness made him an easy target. Suddenly, at the Gabba, he was a man transformed. 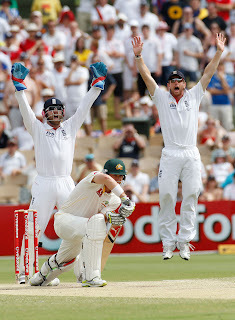 While Cook scored his runs in a nervous manner, Bell took to the bowling in a more aggressive manner, displaying aggressive intent and even running hard between the wickets. In a way, he showed the rest of the batsmen, that there was nothing to fear about the Australian bowling, and that led to normal service being resumed from the 4th day of the match. In the recent test in Adelaide, it was a different situation when he walked in. England already had a 200 run lead, and any runs they would get from that point on, would have been a bonus. It is this situation, where Bell feels the most comfortable. 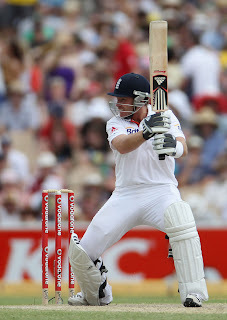 Sure enough, he scored a quick 68, including eight boundaries and a solitary six, to further solidify the advantage. It gave Strauss that extra cushion of runs, to be comfortable with; and ironically, Australia couldn’t score an extra 70 odd runs to force England to bat again. Just like that, all pieces of the English batting are complete. Where, once there seemed to be competition between Morgan and Bell, the latter has now, made himself indispensable. Bell was always marked for greatness, but he never fully realized his potential until now. For a team, which has set its sights on the top ranking, Bell will have a crucial role to play in the coming years. This is where North can learn a thing or two from Bell. After a pretty decent start to his career, Bell’s form started to taper off, and found himself in the situation where North is in. Bell earned the unwanted reputation of making big scores when they didn’t matter, and dealt more with attractive 30s and 40s, rather than match saving/winning centuries. It was only in the tour to South Africa in 2009, he found his mojo, and regained his old touch, while equipping himself with new steel. Since then, whichever opposition he has been pitted against hasn’t mattered. He has learnt to score consistently, and more importantly, perform when the team has needed him the most. North is just three years older than Bell, and has the temperament to score centuries; but unless he learns to score consistently and convert his starts to big scores when his team is in dire straits, it wouldn’t matter, how many wickets he can take. While the lack of alternatives, might make it easier to hold on to his place for a while, he will have to live with the knowledge, that he is not really good enough to cut it on the big stage. For inspiration, he need not look further than his English counterpart, who for years, was compared to a funny looking character in ‘American Pie’, but will now be more known for his part in what is turning out to be a memorable Ashes for England. tracerbullet007 blogs at Like a Tracer Bullet.